TestResources Test Systems, Testers and Testing Machines perform flex or flexural tests when equipped with the correct accessories. 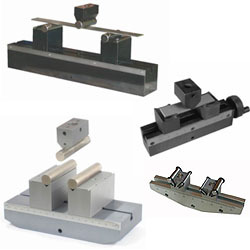 Flexure tests monitor behavior of materials in simple beam loading; or transverse beam tests. Specimens are supported as a simple beam, with the compressive load applied at midpoint, and maximum fiber stress and strain calculated. 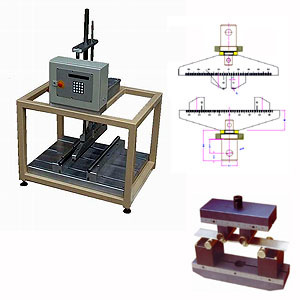 The three point flexural flexural test measures flex or fracture strength, modulus of rupture, yield strength, modulus of elasticity in flexural, flexural stress, flexural strain, flexural stress strain materials response. Flexural strength represents the highest stress experienced within the material at its moment of rupture. There are many standard test methods: ASTM D-797 (elastomers), ASTM A-438 (cast iron) ASTM D-86 (glass), ASTM C-674 (fired whiteware), (ASTM A-360, steel products), welds (ASTM E-190), toughness cables compressive silicon shear education control suppliers asme chamber definition chip silica d671 birch fillet bone sample 4-point flex testing fixture carbon failure design steel copressability tests upgrade fatigue fatigu dynamic servo- 4-point flex testing equipment size e290 dynisco span support compare 4-point small tesile strain desktop tools electrical destructive ductility strenght characterize creep tear stregnth environmental tabletop stent structures strength dimension ferrite 4-pt 4-point flex testing machine advanced test electric dimensions film composite unidirectional software applications 4-point flexural test jig 4-point Tencil f1717 capacity comprssion 3pt4pt surplus devices d 790 conclusion amsler 4-point flex test jigs 4-point flex testers acquisition teste dektop static d-790 4-point flexural test fixtures swick corrugated tinsel beam american 4-point flexural test fixture tester products testers fatigue equipment jig system product apparatus roller rollers jigs rigs span actuator systems frame instrument ents fixtures stand rig crosshead 4pt ficture fixture ceramics tester cylindrical chips 4-point flex test machines 4-point flexural test equipment ering certification cyclic combined cost diameter ceramic tensil tesnile equibiaxial testing cable 4-point flexural test jigs strengh 4-point flex tester endurance economical stiffness 4-point flex test jig used 37c 3pt speed concrete testing epoxy die testre coupon Tes titanium fabrics crack coupling 4-point flex testing fixtures dma data accessories 4-point flex test fixtures 4-point flexural testing machines flex cre description fiberboard (ASTM D-1037), and ASTM D-790 (ISO 178). ASTM D790 determines flexural properties of plastics, high modulus composites and insulating materials. Materials that do not fail by the maximum strain allowed are tested in a 4-point flex test, such as ASTM D6272.